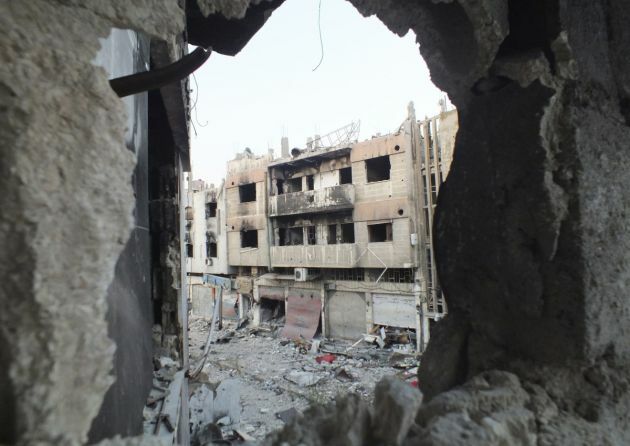 (Photo: REUTERS / Yazan Homsy)A view shows damaged buildings in the besieged area of Homs July 12, 2013. HOMS COUNTRYSIDE, Syria (Reuters) - For months, the western rural region of Homs was an unusual model of coexistence in Syria's brutal two-year-old civil war. Now, it risks becoming a dark episode in the country's deepening sectarian conflict. Syria's uprising-turned-war has forced most Syrians to take sides in a struggle that has killed more than 100,000. Wary of opening a new front, warring parties allowed villages to cooperate quietly with both Assad's Alawite-led forces and the majority Sunni rebels struggling to topple him. "Everyone knew it was happening. The guys would even pass supplies through the checkpoints run by Assad's militias. In front of their very eyes," said Salem, a construction worker from the village of 8,000. "Anyone here with any rationality can see that the outcome of fighting here would almost certainly end in mutual destruction," said another local from al-Zara. That may be a price the army is now willing to pay, as recent gains mean Assad's goal of securing a belt of territory between the capital Damascus and his stronghold on the Mediterranean coast is within reach. Last month the army, led by Lebanon's Shi'ite militant group Hezbollah, seized the strategic town of Qusair near the Lebanese border. If they can cement that win by seizing this rural stretch of Homs, they may also be able to shut down rebel supply lines to central Syria and cut off rebels in the north from their comrades in the south. "WE EAT THEM FOR LUNCH"
As part of Syria's marginalised Sunni Muslim majority, residents identified with the Sunni-led revolt against four decades of Assad family rule. But al-Zara is surrounded by villages home to Assad's own minority Alawite sect, an offshoot of Shi'ite Islam, which has largely stood behind the president. Beyond the ring of Alawite villages is a valley dotted with Christian villages that have largely thrown their weight behind Assad. Fearing the rising tide of Islamism, they joined Alawites in creating "shabbiha", the term for pro-Assad militia. "There are no good Sunnis. There are only the bad Sunnis, who don't carry weapons, and the worst Sunnis, who do," said a fighter from the valley who called himself Johnny. "If we don't beat them now, they will beat us ... so I say we eat them for lunch before they have us for dinner." Johnny's village is a few kilometres (miles) away from the hillside Sunni town of al-Hosn, famed for the majestic Crac de Chevaliers castle overlooking it. For the first time in centuries, the crusader fortress is under threat - this time from the artillery and airstrikes of army forces trying to push out rebel forces. In the nearby border town of Telkalakh, Assad's forces reneged on a truce they made with the opposition in early 2013. According to one activist there, they called out on loudspeakers: "You saw what happened in Qusair. Surrender with your weapons and we will guarantee your safety." Like many towns in the area, Telkalakh had operated under a deal agreed with both the rebels and Assad's forces. The army moved out its troops and checkpoints, and the rebels expelled foreign militants smuggled in from neighbouring Lebanon. Rebels let civil servants from neighbouring towns enter Telkalakh each day to work at regional government offices, and the army controlling nearby roads let locals bring in food. It was residents who pressured the rebels there to surrender this month, hoping to maintain the region's fragile peace. Given Telkalakh's surrender, Assad's forces anticipated a quick capitulation in al-Zara when they issued a similar ultimatum this week. "The Alawite villages surrounding us are ferocious about defending the regime," said Salem, the al-Zara construction worker. He is worried about the consequences of his town choosing battle. "We have nothing to gain from resistance." By late Thursday, the rebels managed to strike at an Alawite village nearby and steal army tanks. The result, locals said, was a huge army mobilisation including air strikes heard throughout the region on Friday morning. "THERE WILL BE BLOOD BETWEEN US"
Rebels are still trying to negotiate neutrality with neighbouring Christian towns. "Rebels told me, 'What brings (Muslims and Christians) together is more than what pulls us apart. But if the Christians join this attack there will be blood between us'," he said. "We did what was required. Al-Hosn was warned to surrender," said the fighter Johnny. "This is a war. The faint-hearted don't win wars." Raed al-Shaer, a rebel commander in al-Hosn, warns that Christians may find similar surprises as al-Zara's Alawite neighbours did this week. "Our fate is tied with the people of the valley," he told Reuters in an interview. "We have sleeper cells among the people of the valley. No military action has been requested of them - yet." Fighters in al-Hosn say that unlike previous deals arranged, the choice between war and peace is now out of locals' hands. "The choice is not with them, it was made by the rebels," one activist in the town said. "And it is: We fight, or we all die trying."